A Fresh Cranberry Orange Smoothie is a delicious smoothie to enjoy in the morning or an after workout snack! 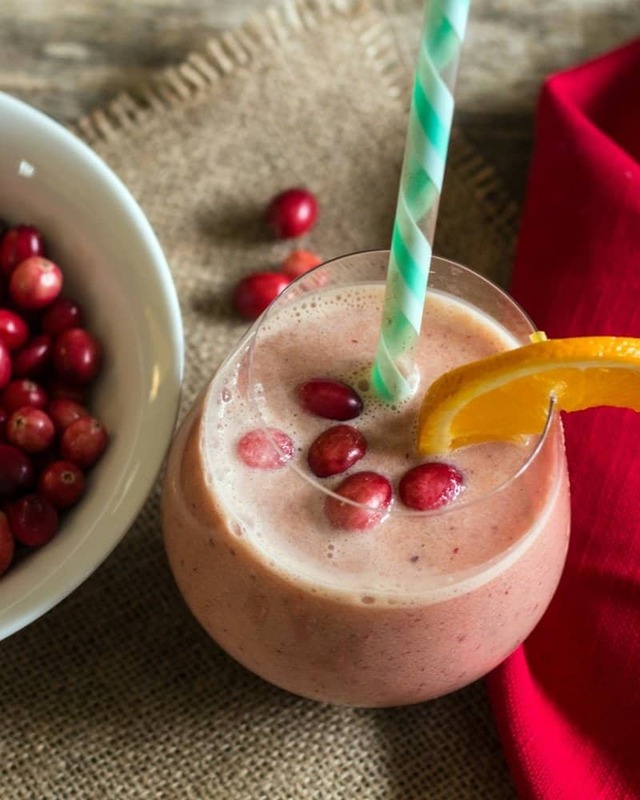 Have a lot of cranberries, make a Cranberry Smoothie! 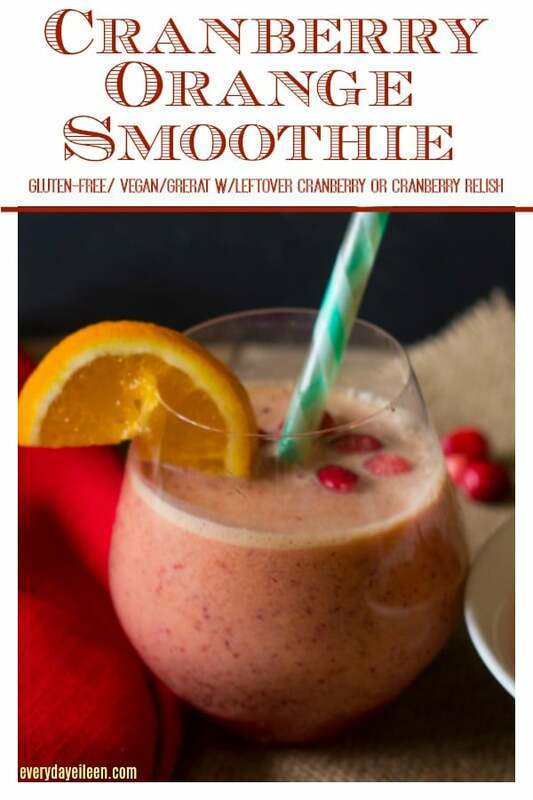 This tasty smoothie is a great way to use leftover cranberries or cranberry relish for a healthy treat! I hope everyone enjoyed their Thanksgiving and now its Holiday celebrations and shopping time for the duration of this busy time of year! It’s such a hectic season, besides Holiday parties filled with cocktails, appetizers, baked cookies, everyone is so busy and eating on the go! What better than a nutritious Cranberry Smoothie to fill your belly. I love cranberries and really overdosed buying for #cranberry week and Thanksgiving! Freezing cranberries is always great to save them to use all winter. Use fresh cranberries to make muffins, bread, and crisps throughout the winter. Clearly, I love cranberry and orange together and I needed to detox after all those yummy Thanksgiving calories! Thus we have this fabulous Cranberry Orange Smoothie! Can fresh or frozen cranberries be used to make a cranberry smoothie? Either fresh or frozen cranberries can be used to make this smoothie. I have leftover cranberry relish and cranberry sauce, can either be added to the cranberry smoothie? Leftover cranberry relish, make a cranberry smoothie. Make this smoothie with 1/2 cup of cranberry relish in lieu of fresh cranberries and it was delicious! I have yet to try cranberry sauce in this smoothie. Feel free to give it a try and start with 1/3 cup cranberry sauce since it is sweet. What are the nutritional facts about cranberries? This article gives a lot of useful info if you are looking for in-depth nutritional info about cranberries. Cranberries are in the blueberry family. They are 90% water and high in carbs and fiber. Great for distance running training. Adding cranberries into your diet is a great way to stay on a heart-healthy dietary plan. Cranberries can help in the prevention of urinary tract infections. Ninja Mega Kitchen System: I believe many of you regulars know how much I have loved having this blender! 100% Pure Maple Syrup: Use pure maple syrup, no high fructose, pure and delicious! To make freezer packs, freeze the o.j. in ice-cube trays. Place the cranberries on a sheet pan and place in freezer for about an hour. Label freezer bag with the title and addition of almond milk, turmeric and agave. Place 2-3 frozen cubes of o.j and the cranberries into the bag. Makes great freezer ready smoothie packs with the orange and cranberries! Into a blender, add almond milk, cranberries or left-over cranberry relish, orange juice, and turmeric. Test for sweetness, add sweetener of choice, blend, test flavors, adjust if needed. 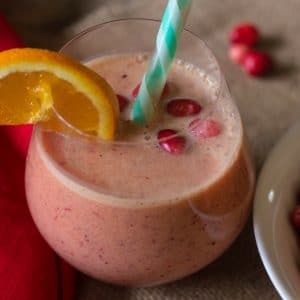 A wonderful blend of cranberry, orange juice, light almond milk, and turmeric to give a wonderful smoothie for the morning or an after workout treat! Low-fat, low-calorie and gluten-free! Add the unsweetened almond milk, cranberries, orange juice, and turmeric. Blend well! Add sweetener of juice, blend well, taste for flavor. Adjust sweetness if needed. Drink and enjoy. Note 1: I had some leftover cranberry relish and I used about 1/2 cup of the relish in place of fresh cranberries and wow, delicious! Note 2: For a sweetener, use your favorite, I usually use 100% maple syrup or coconut sugar. Stevia works well too. Use honey of not following a vegan diet. Thank you for the amazing smoothie recipe, Eileen! I’ve just made it for my kids and they loved it a lot! That is so awesome Michael! I am so happy your kids enjoyed the cranberry orange smoothie! We love it too! Thank you for taking the time to let me know how you enjoyed the smoothie! Smoothies are always a hit around my house! I’ve never added turmeric, but will give it a try! Time for a healthier new year! Absolutely Renee, Happy New Year and enjoy! Store bought smoothies always seem to have banana in them, which I’m not keen on in smoothies. Glad to see no bananas here! This smoothie looks absolutely delicious! Thank you so much! I agree, I don’t need a banana in every smoothie! I’m trying to work on drinking more smoothies, and this flavor combo looks so interesting! YUM! I make smoothies everyday. I’ll have to try this one! Gotta admit, either you are talented with photo editing or that drink looks incredible! Or both! Thanks for sharing this! This looks SO Good and I love how pretty it looks in a mason jar! I need to try this ASAP! Ooooooo isn’t moo this sounds fantastic!!! I’m obsessed with all things cranberry. Yum. This sounds really healthy, and just the boost I need after the holidays. I love orange in anything. I also love that you added turmeric, as I know it contains so many great benefits. Thank you Shann, I hope you try this smoothie, I love it! You were actually smart to stock up when they were in stores. I’m wishing I had! I guess I can get them frozen though. This smoothie sounds wonderful! Thank you Liz, I do tend to stock up on the seasonal fruits and freeze them for later. I will be doing this with the remainder cranberries and persimmons too! I hope you enjoy! Thank you so much Kaz! I promised to take better care of myself this year. I know it will be a difficult battle to face but I have committed myself to it. I will try this smoothie recipe of yours. It does look like it is very healthy and would fill me up for a longer period of time. Never had a cranberry smoothie before, but it looks delicious! I have a smoothie nearly every day, I’ll have to try this out soon. Thank you! I love cranberry and orange together. This smoothie recipe sounds absolutely delicious! This sounds incredibly healthy and yummy! What a great idea! I love a good smoothie! This one sounds fantastic. I love the taste of cranberries also–adding two other favorites to the mix (apple and orange) is making me want to go and make up a batch right now. I hope you give it a try MIchele, let me know how you liked the recipe! I love cranberry and I love orange, so this sounds like a great combination! I’ll have to try making this smoothie sometime. Interesting combo, and it looks really healthy!! Turmeric is so good for us:-). I’ll pin to try later! That is great, I hope you enjoy! let me know when you try it! Smoothies are my to go to meals when I’m having a busy day! So filling. 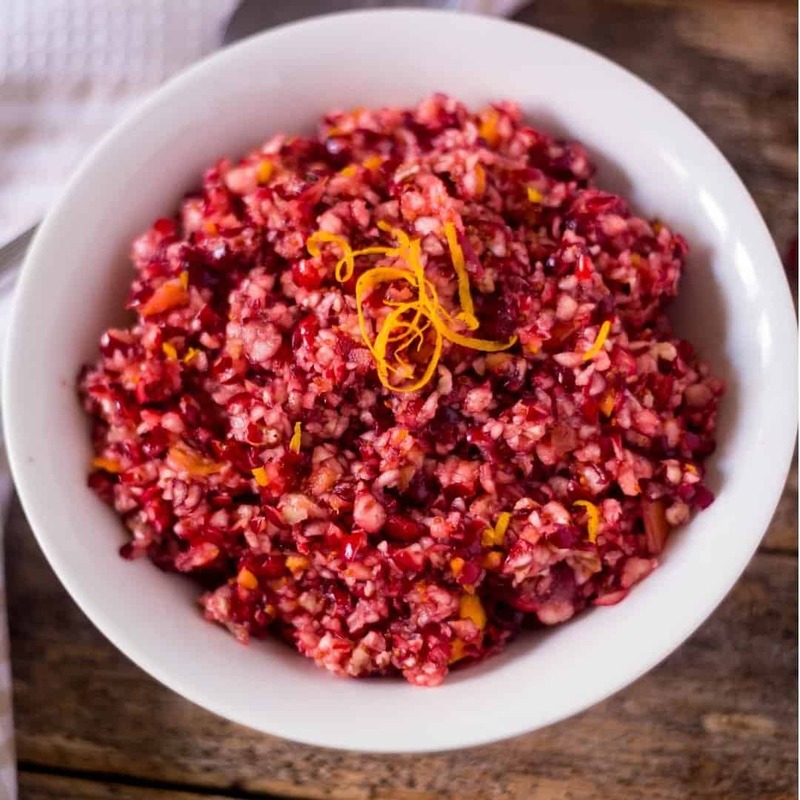 Will have to try this orange and cranberry recipe! this recipe just screams health. I can’t wait to try it. Let me know when you make it, I hope you enjoy! Cranberry and orange is a favorite flavor combo for me. I’d love to try this. So glad to hear Rosey! This sounds like a tasty smoothie. I’ll have to try it as I have a lot of cranberries left over. This smoothie looks so refreshing and yummy! I was also surprised with adding turmeric. I know of its health benefits, but I have never had it in a smoothie. I will give this recipe a try. Turmeric and cranberry are both great. Did this turn out tart? Thank you Claire, I hope you try this one! 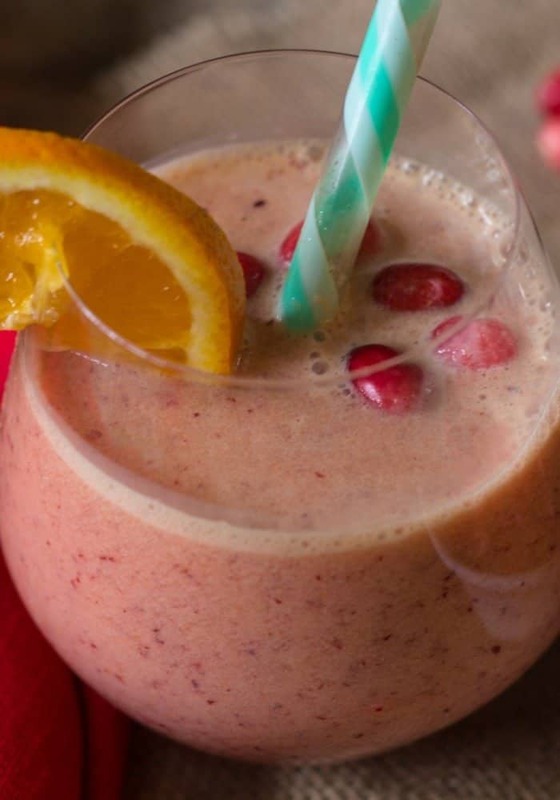 Love cranberries & orange what a wonderful combination for a smoothie. Look delicious an is a great pick her upper in the morning. I use turmeric in most food and also smoothie give it that extra special flavor. I love turmeric, it is a new flavor for me! Starting using it a few months ago and I love it! I love cranberries and oranges, but I’ve never thought of putting them together in a smoothie. I’ve got to try this. I agree and I am glad I put the two together, so tasty! I love smoothies with apple in it. Well, I like fruit smoothies in general! Thanks for this new recipe to try! I love them too! I hope you try this one! Exactly what I am doing this week! Enjoying my smoothies!